Imagine a program hand tailored to your 7th grade son or daughter. A program unlike any other your child has experienced. One that empowers, enlightens, Fun, fosters self-esteem, builds self confidence and creates friendships that may last a lifetime. Enter CTEEN JR! Our CTEEN JR program affords your child the opportunity to take part in social activities, become involved in humanitarian projects, take part in trips, enjoy cooking, Friday night dinners and much, much more all while learning about Jewish history and values in a joyous, friendly co-ed atmosphere. 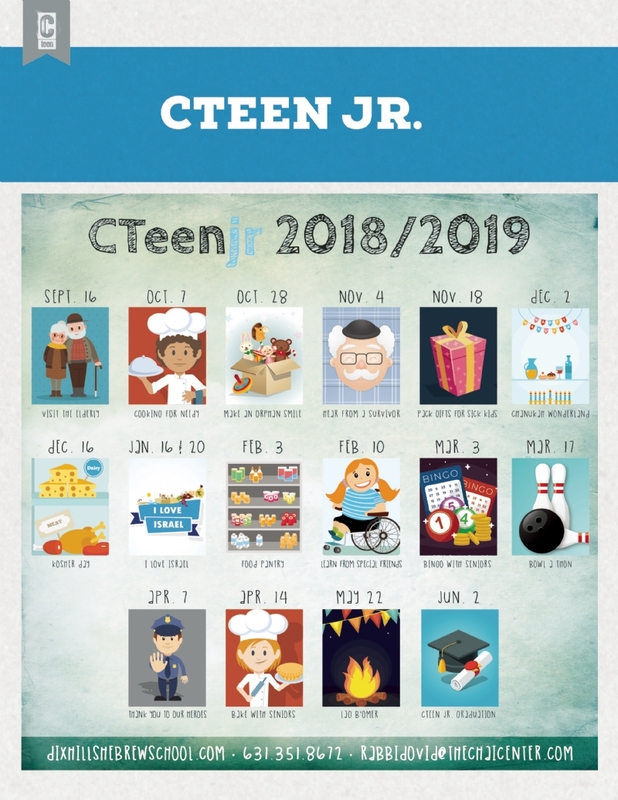 It is important to note that while CTEEN will be taking place on Wednesdays from 4:30–6:30 p.m. and two Sunday evenings each month from 6:00-7:30 p.m. CTEEN JR is a whole new program, hand tailored to bridge the gap between our Hebrew School and our C-Teen Youth Program. Due to popular demand the program was created to accommodate both 7th grade girls and boys, with combined learning experiences and activities on Wednesday afternoons and specially tailored activities specifically geared to Bat & Bat Mitzvah on Sundays.